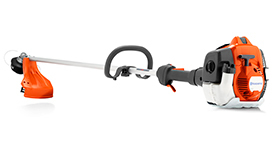 The Husqvarna 525LST trimmer is a durable and powerful trimmer designed for professional use. This is a robust trimmer with durable components providing trouble-free use and making it easy to maintain. Featuring the patented X-Torq engine, users will have more power with less fuel consumption and exhaust emissions. Other features of the 525LST trimmer include an Air Purge system that removes air from the carburetor and fuel system for easier start, auto return stop switch and other intuitive controls making the choke and purge easy to reach and understand. Lightweight, well-balanced and ergonomically designed, users will experience minimal fatigue while still getting the job done quickly and efficiently.